Standard disclaimer applies here: some capabilities are hardware-dependent and, as such, only work on certain iPhone models. Speaking of which, iOS 8 is compatible with any iPhone from the iPhone 4s onward, any iPad form the iPad 2 onward and the fifth-generation iPod touch. Keep in mind that some features are unavailable in certain markets over legal and licensing reasons. Fortunately, Apple provides a handy webpage that lays out iOS 8 feature availability in layman’s terms. Here’s what we’re going to look at in this tutorial, sorted alphabetically. 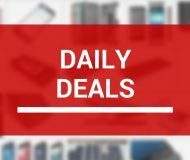 App Store Bundles enable the creation of special software sets by letting developers bundle up to ten of their apps into a single item that can be purchased with a tap. Bundles typically cost less than the sum of the individual apps contained within, making them an attractive promotional tool for games makers and developers of enterprise software. 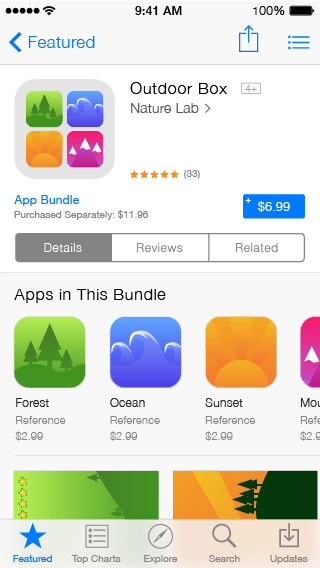 Purchasing a bundle downloads its apps individually to your device. And like the “Complete My Album” feature on iTunes, there’s a “Complete My Bundle” option to purchase the bundle without paying the price of the apps you already own. 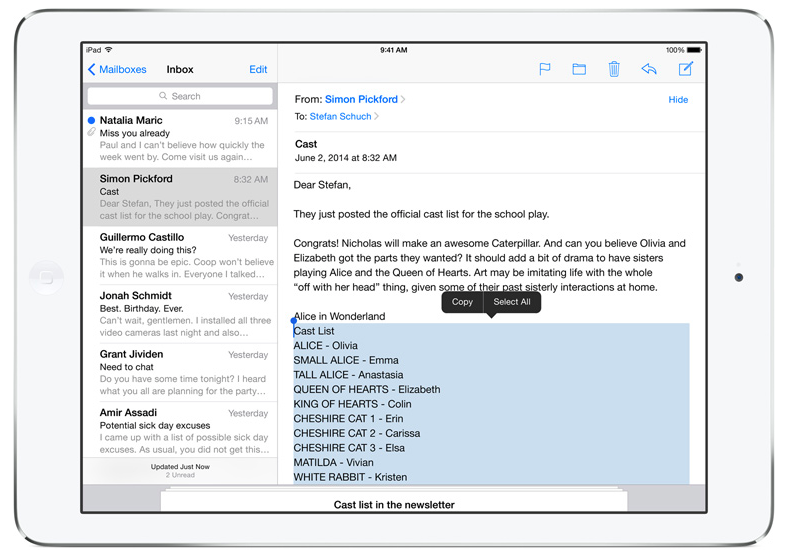 Other notable App Store enhancements in iOS 8: the Apple-owned TestFlight app to test beta software, video previews alongside screenshots in the App Store, improved search with suggestions and continuously scrolling results, Trending searches, the new Explore tab and the new Editor’s Choice label for highlighted apps. iOS 8 makes it easy to detect battery hogs. 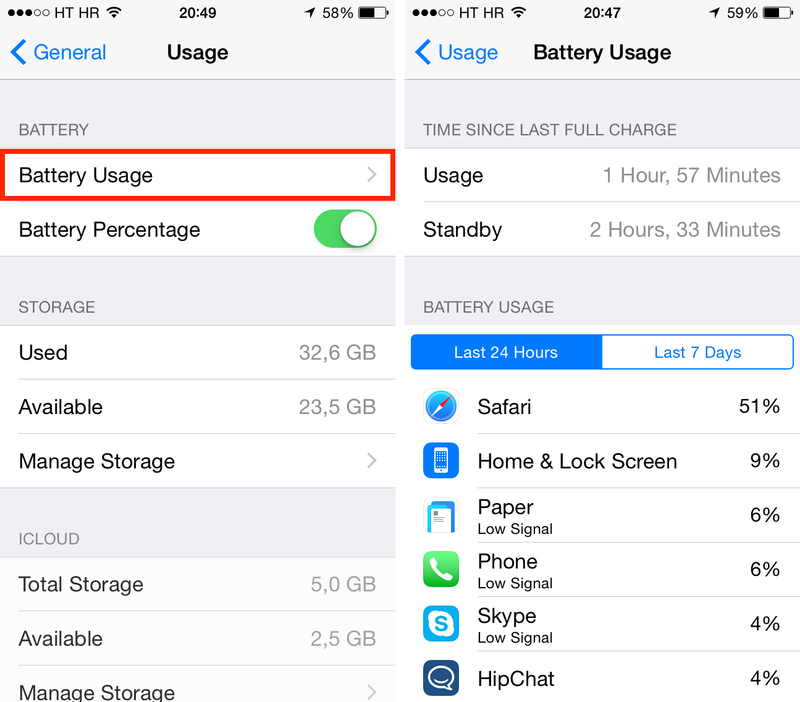 A new Battery Usage section found under General > Usage > Battery Usage breaks down battery consumption by app. The proportion of battery used by each app in the “Last 24 Hours” or “Last 7 Days” is shown (as a percentage), but only when the device is not charging. This screen lets you easily identify and uninstall misbehaving apps that drain your device’s battery. As third-party keyboards and other App Extensions are now supported, iOS 8 introduces new ways apps might monopolize system resources. In other words, installing an app also makes its custom actions, if any, available system-wide, through the multi-purpose Share sheet. 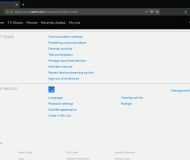 Custom actions can include some sort of interface or no interface at all, an example of the latter being the Bing Translate action that Apple demoed at WWDC 2014 which automatically replaces the existing text on a webpage with a translated version. 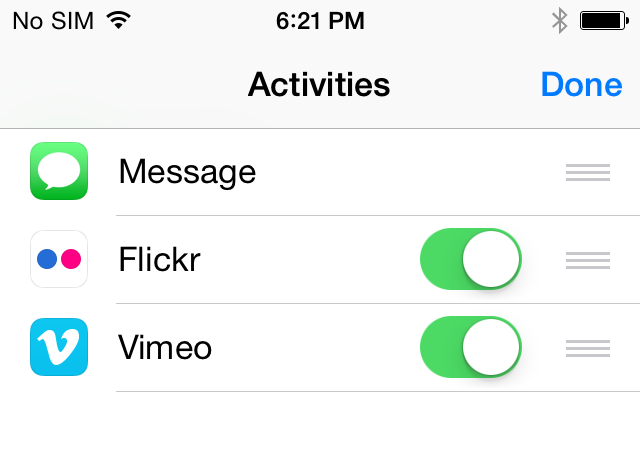 Custom action buttons in the Action sheet can be re-ordered (see below) so oft-used actions are only a tap away. Examples of custom actions include buttons that let users watermark documents, add something to a wish list, add an item to Pinboard, upload a photo to Flickr and more. Custom actions enable deeper interactions between third-party apps and drive massive improvements as a result of third-party ingenuity and innovation. If Chrome’s ability to switch from a mobile site to its desktop counterpart is the sole reason you’re still relying on Google’s browser on your iOS devices, you’ll be delighted to learn that Safari in iOS 8 now packs in a similar feature. Just visit any website and then tap on Safari’s address bar. This will position the cursor inside the combined search/address bar that now includes a handy list below with your favorite and frequently-visited sites. 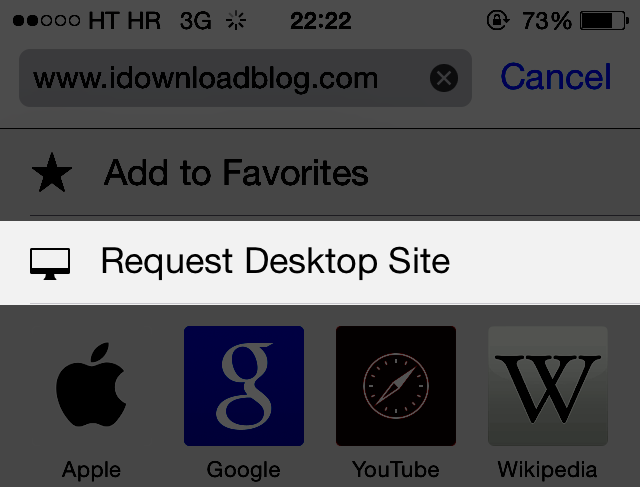 Now pull down on this list to reveal a new “Request Desktop Site” option. Choosing it tells Safari to retrieve a desktop-optimized webpage, if any. Another option allows you to add the site to your favorites. Perhaps the biggest long-term change in iOS 8, Extensibility allows your apps to interact with one another in ways commonly associated with Android and not possible on Apple’s platform before. For example, Instagram will be able to add a share sheet to iOS for quickly posting photos, and Pinterest can enable webpage or photo pinning from within a browser. App Extensions, as these things are called, are distributed as part of their app binaries and are therefore installed automatically by downloading the host app. iOS 8 supports the following types of third-party App Extensions: Share, Photo Editing, Storage Provider, Document Picker, Today, Custom Keyboard and Custom Actions. This is 1Password’s iOS 8 extension in action. 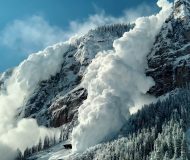 Share extensions, as mentioned before, provide more options to share photos, videos, websites and other content with online services. Photo Editing extensions embed photo and video editing filters directly into the stock Photos or Camera apps. Below is a nicely done video that showcases an awesome Camera+ extension for iOS 8 Photos. Storage Providers are interfaces between apps and custom storage locations such as, for example, Dropbox. Document Pickers let you access files outside an app’s sandbox, so you can edit a single document in your favorite apps without creating multiple copies. Today extensions are actually widgets sitting in the Today view of Notification Center. These lightweight extensions typically provide quick updates like stock quotes or breaking news stories, or make possible brief tasks such as posting updates on package deliveries. Check out the Today widget of Hours for iPhone below (also coming to the Apple Watch), it really changes the way you use the app for the better. Custom Keyboards are self-explanatory (more on these later) while the previously mentioned Custom Actions let you perform specific tasks like translating a webpage, watermarking documents and more, in any app which supports iOS’s standard Share sheets. 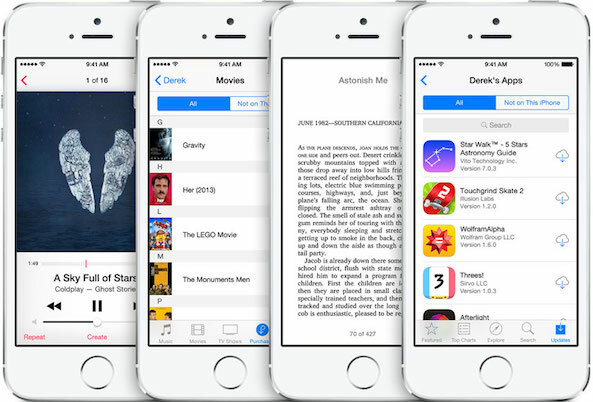 Family Sharing is a great new feature in iOS 8 which lets you share purchased iOS 8 and Yosemite apps and iTunes media between up to six different devices, without requiring them to use the same Apple ID as Home Sharing. Available under the iCloud section in Settings, Family Sharing requires that you define a ‘master’ device which must have a credit card on file. The feature, which also honors your parental controls, then lets parents (the ‘master’ device) to approve purchases and downloads made on other devices. Family Sharing can also be used to automatically share photos, calendars and reminders among family members, and even track iOS devices — including those that belong to your family or friends. 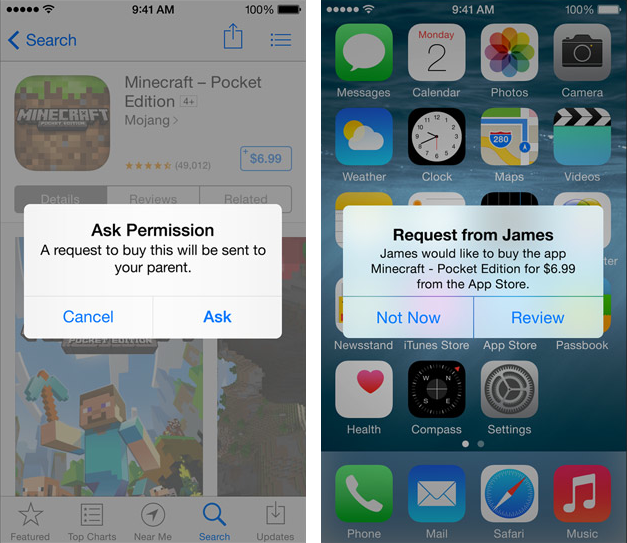 Not all purchases are eligible for Family Sharing as Apple provides developers with an option in their iTunes Connect developer portal to choose whether or not they want their apps to be enabled for Family Sharing. Family Sharing-enabled iOS and Mac apps have a special label in the Information pane where the Seller, Category and other app information is listed, as depicted on the screenshot below. 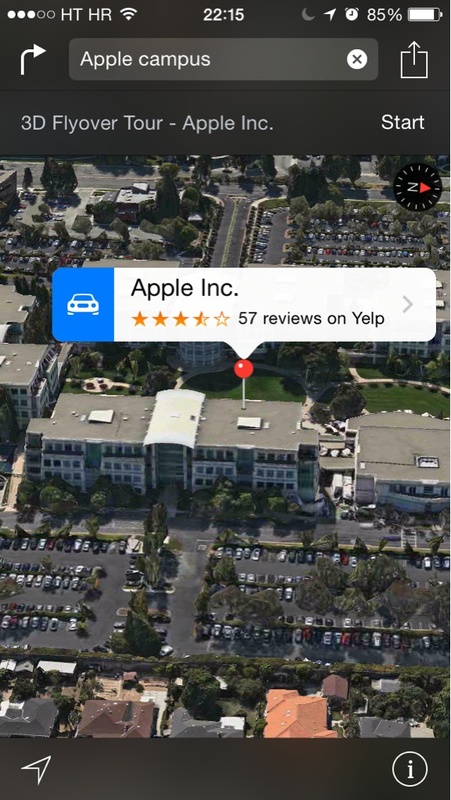 In addition to standard three-dimensional aerial views in Apple Maps known as Flyover which debuted as part of the iOS 6 launch back in 2012, iOS 8 has now added scripted virtual tours of select landmarks and cities, like the Yosemite National Park, Apple’s corporate headquarters in Cupertino, California, Wellington in New Zealand and more. 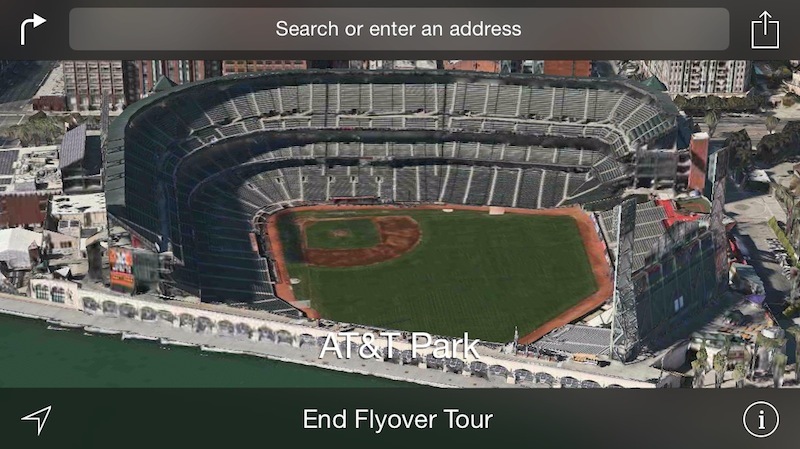 To access Flyover City Tours, turn on 3D view in Apple Maps by hitting the “i” button in the upper-right and find a desired location using the search field at the top. The “3D Flyover Tour” label should appear below. Tap it to start a virtual tour. The feature is region-dependent so not all Flyover locations have Flyover City Tours. A list of locations with Flyover City Tours enabled can be found on the iOS 8 Feature Availability webpage. 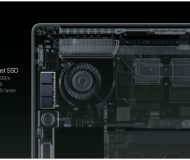 Handoff is the central part to Apple’s philosophy concerning Continuity, asset of technologies it designed for seamless transitioning between iOS devices and Macs. 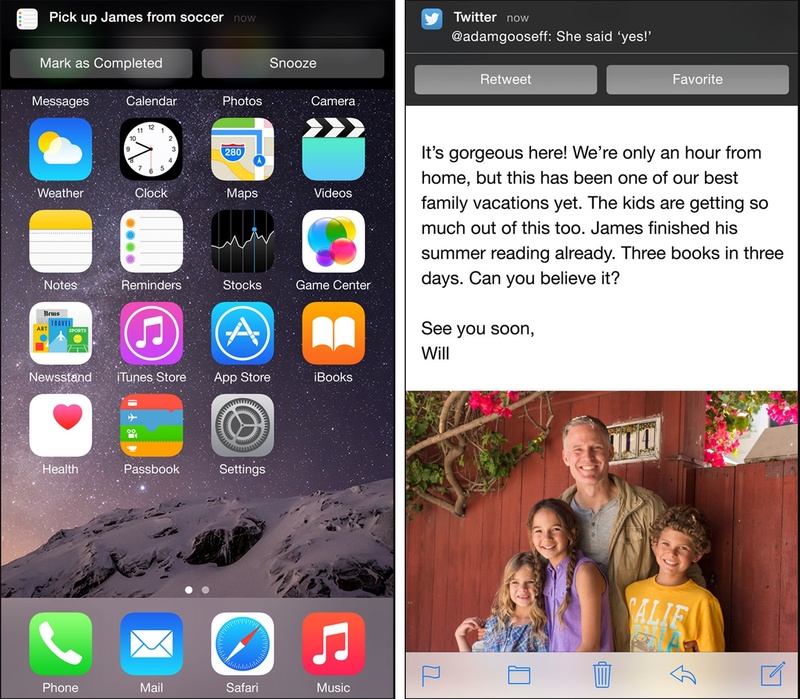 In a nutshell, Handoff helps you complete tasks across multiple devices authorized with the same iCloud account. You might, for example, start composing a long email on your iPhone and sit down at your desk to finish it on your Mac later, or vice versa, making the Apple experience even more seamless. Handoff implementation is seamless and elegant. 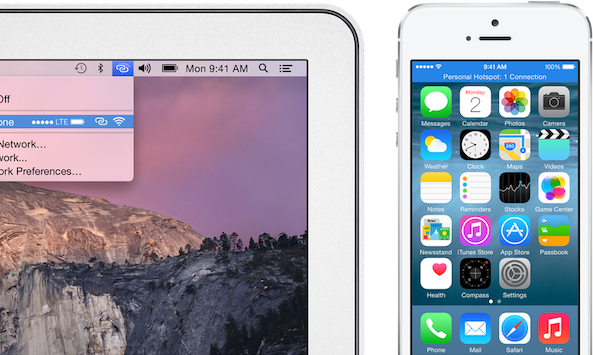 Requiring devices with short-range Bluetooth 4.0 connectivity, Handoff puts an app icon on the Lock screen of your iOS device or your Mac’s Dock. Grab it with your finger and pull up, or click the icon in the Dock, and you’ll be immediately taken to the app with content exactly as you left it on the previous device. 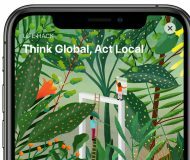 As developers have been given the freedom to choose whether or not they wish to support Handoff, don’t expect each and every app on the App Store to be Handoff-enabled. 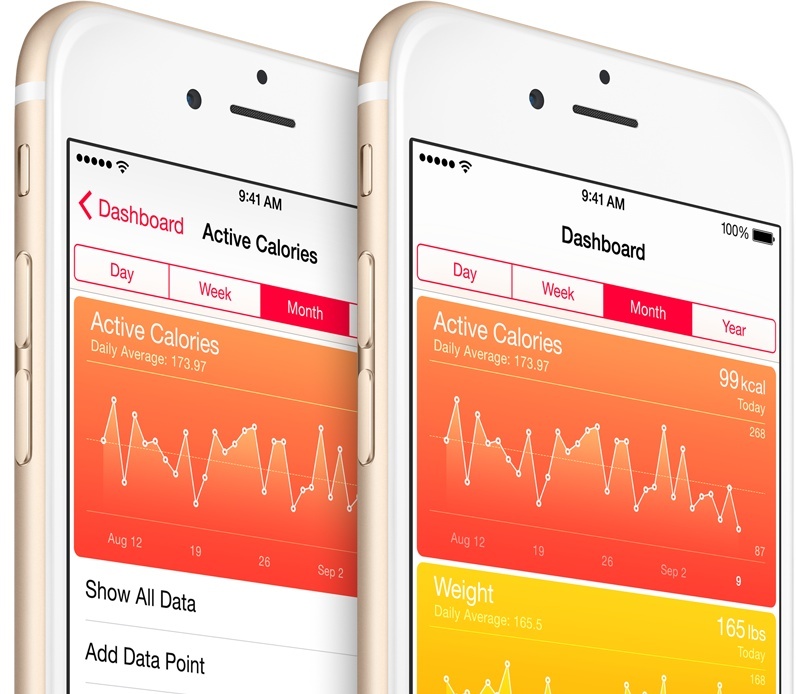 Health is much more than a brand new stock app in iOS 8. 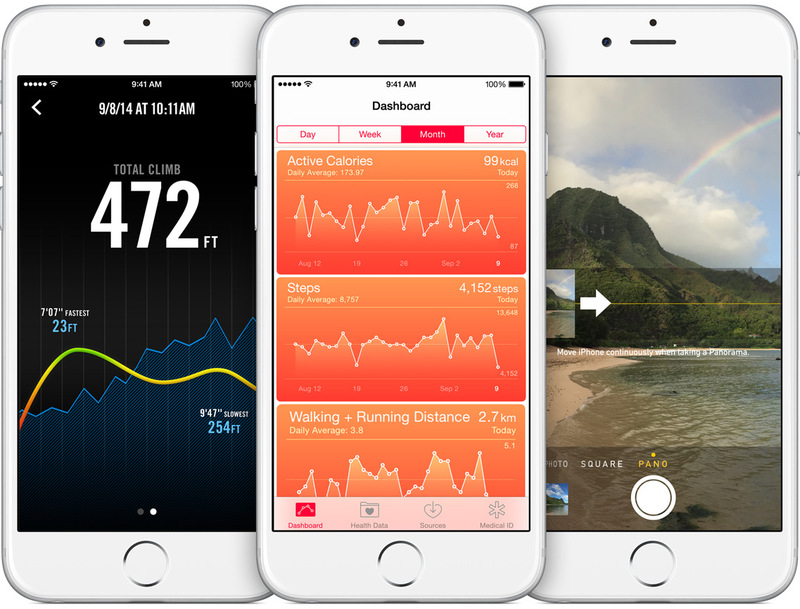 Taking advantage of the new HealthKit in iOS 8, Apple’s conceived the Health app as a central repository for all your health and fitness related data. 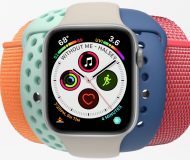 HealthKit-enabled apps and accessories, as well as Apple devices with motion-tracking capabilities such as the Apple Watch and the iPhone 5s/6/Plus can also store/read data from Health database. For example, you can permit the data from your blood pressure app to be automatically shared with your doctor. Or, a nutrition app could use the Health database to tell your fitness apps how many calories you consume each day. Using this data, Health can over time provide a comprehensive picture of your well-being via an easy‑to‑read dashboard that can be customized to include and exclude items like heart rates, calories burned, blood sugar, cholesterol and what not. 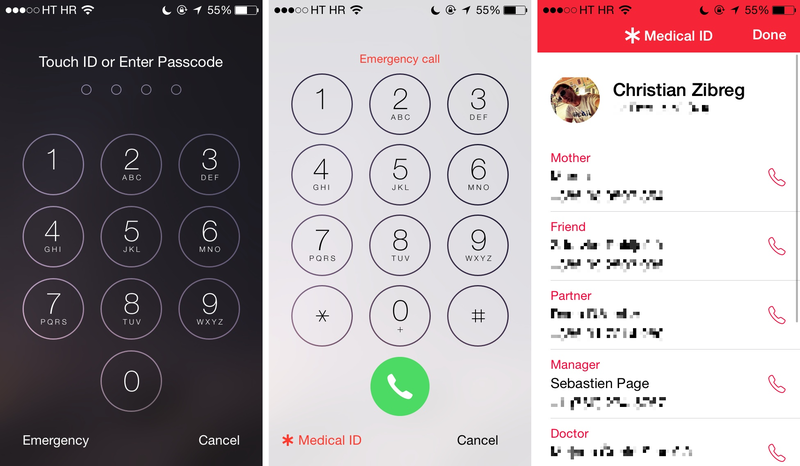 In addition to managing the different types of data being managed by Health, you can also create an emergency card which will be accessible by swiping left on your Lock screen and tapping Emergency and then Medical ID. A new Health section in Settings > Privacy > Health lists apps that have requested access to your Health data. Health is available on the iPhone 4s or later and the fifth-generation iPod touch. Siri in iOS 8 now has an always-listening mode, but only when your device is plugged into a power source. Much like Android’s ‘Ok, Google’ function, this feature listens to a keyword — in this case ‘Hey, Siri’ — to activate the digital assistant. 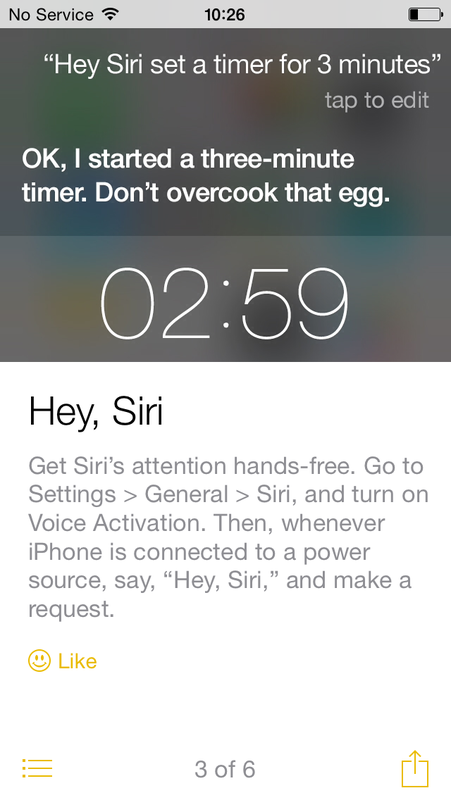 ‘Hey, Siri’ description in Tips, another new iOS 8 stock app. 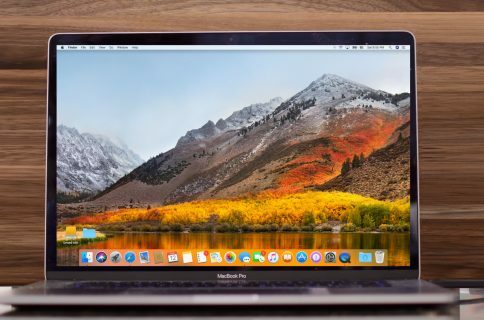 Despite Apple’s unwillingness to enable it when the device is not plugged in, ‘Hey, Siri’ should be very useful when you’re working on your Mac and need quick answers from Siri from across the room, without affecting your device’s battery life. ‘Hey, Siri’ must be activated by flipping the Voice Activation switch in Settings > General > Siri to ON. 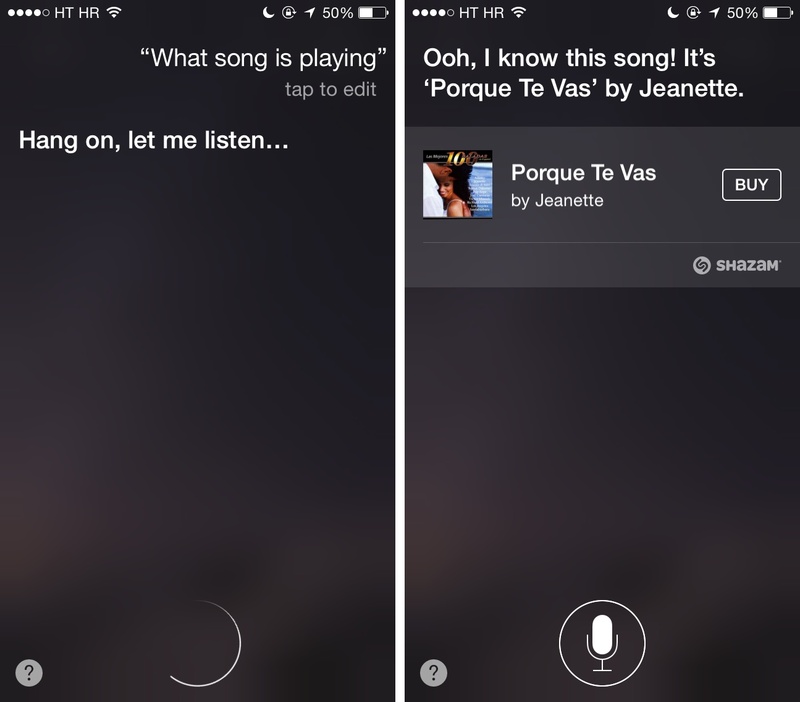 Siri in iOS 8 also integrates with Shazam to identify the currently playing song — just ask “What song is playing”. You even get a handy Buy button to purchase the recognized song on iTunes and another one to open Shazam for more information. 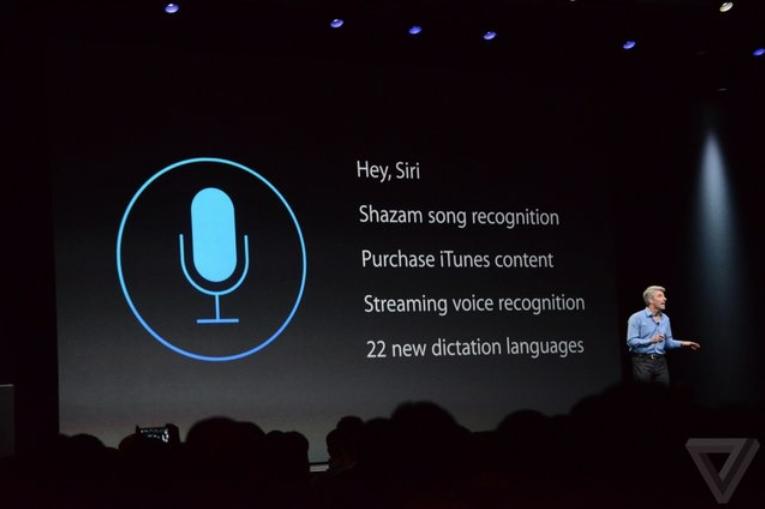 Other Siri improvements in iOS 8: 22 new languages and streaming voice recognition which displays the text of what you’re saying as you say it, as opposed to having to wait until it processes your words (network connection is still required, though). 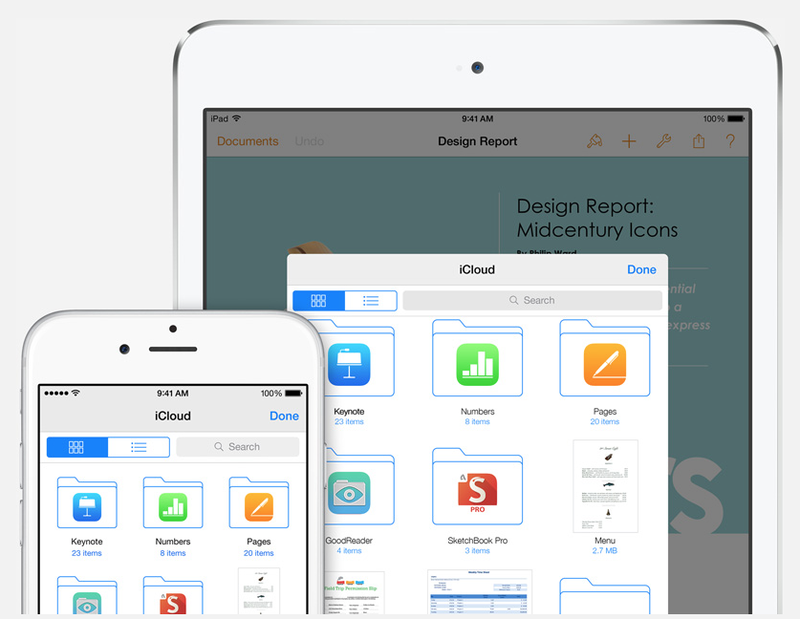 That free iCloud storage (currently five gigabytes per Apple ID), can now be at last used to store both personal files and app documents into the cloud. 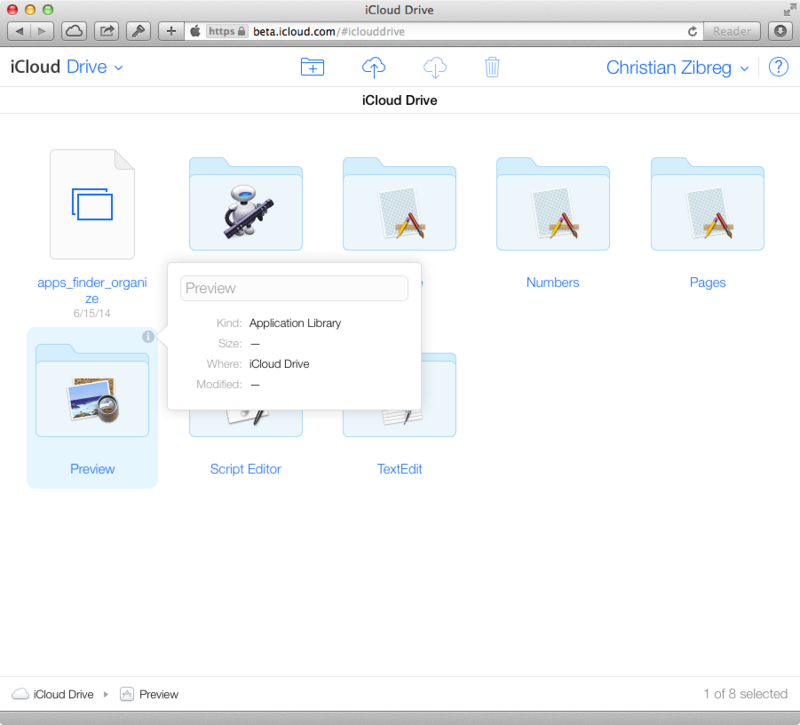 Using built-in iCloud Drive support in Yosemite’s Finder, or the Windows-compatible web interface at iCloud.com, you can upload files to your online storage, rename and delete files and folders, share them with others and more. In iOS, any app using the iCloud document picker automatically gains support for iCloud Drive, so you can browse the iCloud Drive file structure and store files in arbitrary locations in apps like Apple’s Pages, Keynote and Numbers, for example. To enable iCloud Drive, go to Settings > iCloud and flip the iCloud Drive switch to ON to allow apps to store documents and data in iCloud. This is where you can also disable or enable iCloud Drive on a per-app basis and tell iOS 8 to use cellular data to transfer iCloud Drive documents and data between your devices. 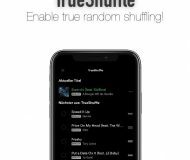 The feature also makes it possible to open a document stored in another app’s folder, which is incredibly convenient as apps can finally share files with one another in more logical ways than before. 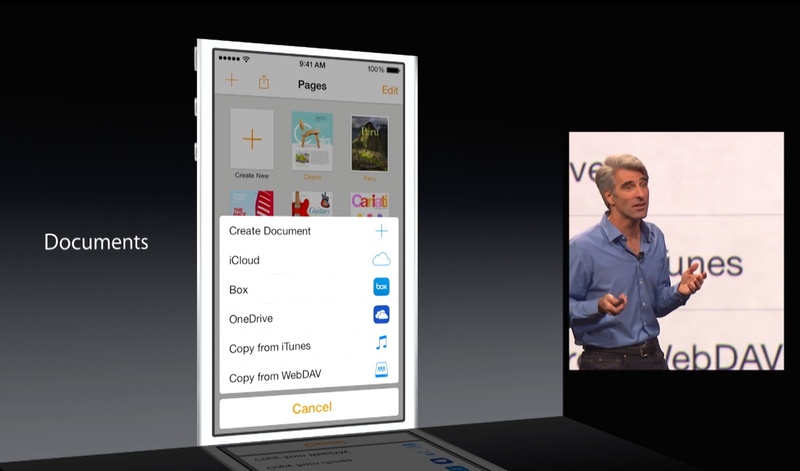 It’s Apple’s way of making up for hiding the iOS file structure in apps all these years. It removes much of the friction associated with working on a single document in multiple apps while increasing the flexibility of iOS workflows dramatically. 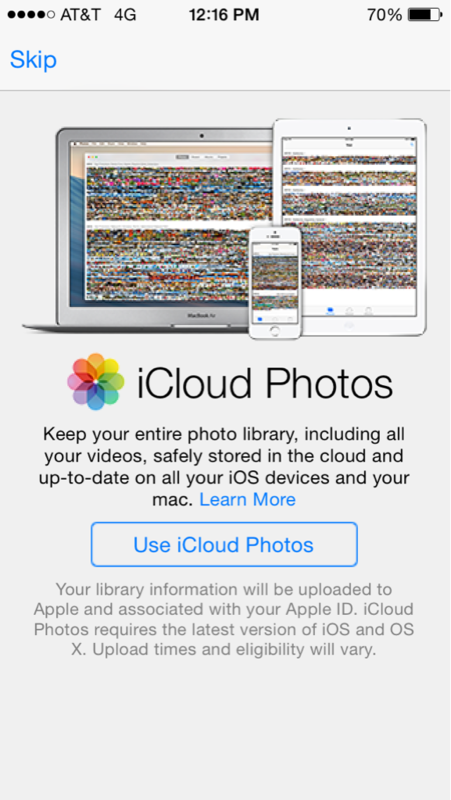 iCloud Photo Library is just that — a place for your photo library where photos automatically synchronize between iOS 8 devices (and soon between OS X computers, too, as Apple readies Photos for Mac for an early-2015 release. Taking advantage of your available iCloud storage, iCloud Photo Library is built right into the stock Photos app and can be enabled by setting the iCloud Photo Library switch to ON in Settings > Photos & Camera. Enabling the “Optimized iPhone/iPad Storage” option ensures that Photos will resize images to your device resolution before downloading them from iCloud. As a result, it’s now possible to store more photos in iCloud Photo Library than your device can hold and still scroll through them with ridiculous ease, as if stored locally. And don’t worry, an option in Photos to download whole albums in their full-resolution glory is just a tap away. Of course, iPhone photography fans with massive cloud libraries should upgrade their iCloud storage, which is now available at the following reduced prices: 20GB/200GB/500GB/1TB for $1/$4/$10/$20 per month. 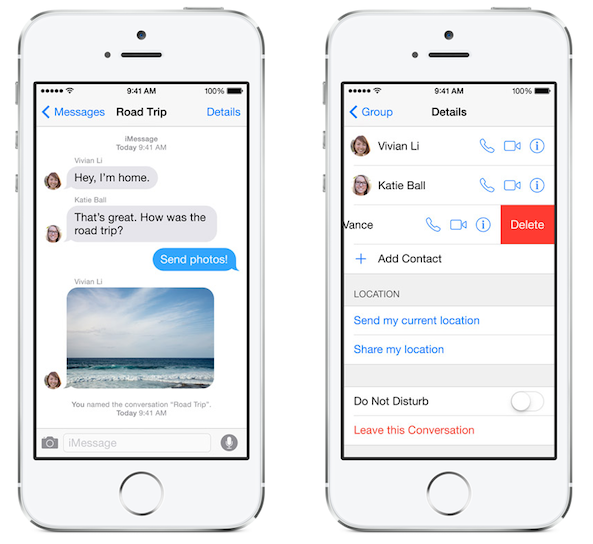 Messages in iOS 8 features a number of important improvements. Among them: way better group-chatting with the ability to mute notifications for message threads, support for exchanging quick videos and short walkie-talkie-like audio snippets, location sharing, the ability to video all media attachments, Handoff support and more. In terms of group conversations, Messages addresses an annoying onslaught of notifications when multiple participants are engaged in the conversation: there’s now a brand new Do Not Disturb switch which mutes all alerts in a group conversation. Simply tap the Details button in the upper right corner of your conversation thread, set Do Not Disturb to ON and you’ll no longer receive notifications from that conversation (messages will still reach your device). Connecting your iPad or Mac to your phone’s personal hotspot is no longer a multi-step affair requiring that you create and use a network password. Now when your iPhone is close by, its name will automatically appear in the list of Wi-Fi networks in Settings on your iPad and in the Wi-Fi menu on your Mac. 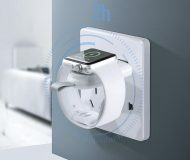 To connect to its hotspot, just select it and — voilà — you’re connected. It couldn’t be simpler than that and once your try Instant Hotspot, you’ll be wondering how you’ve ever managed to live without it. As a bonus, when you’re not using your iPhone’s cellular network iOS 8 automatically disconnects your devices to save battery life. When using Instant Hotspot, the Home screen will show the blue bar at the top. 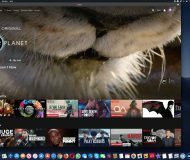 And in a typical Apple fashion, your iPhone’s signal strength and battery life indicators are also shown right in the Mac’s menu bar, under Wi-Fi networks. 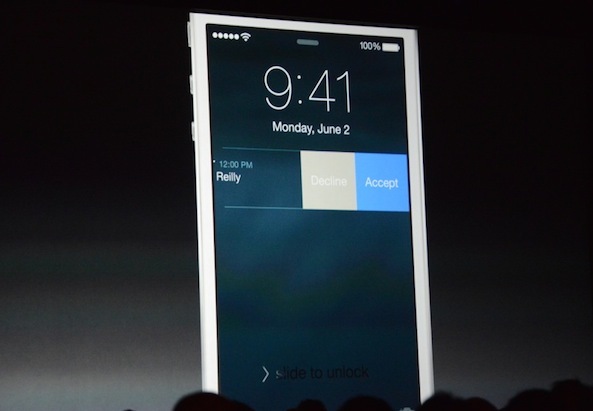 Notifications in iOS 8 can now be interacted with. Stock apps, for example, allow you to swipe alerts on the Lock screen in order to reveal options. For example, a Messages alert can be swiped to the left to reveal the “x” sign to dismiss it. In the case of Mail, available interactions include flagging, marking as read and archiving. Another example: interactive Calendar notifications include the handy Accept and Reject buttons. Needless to say, Apple allows developers to program these alerts to their liking. All told, iOS 8 allows you to interact with your favorite apps from within their notifications in ways not possible before. 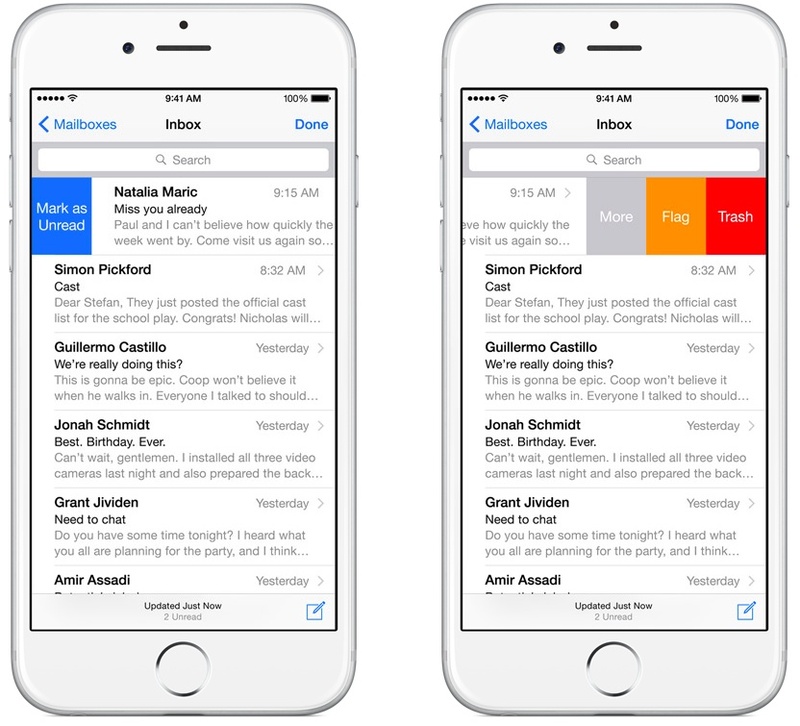 Mail in iOS 8 makes extensive use of all-new swipe gestures that can be performed from the inbox list to help you sort through your emails with breeze and fewer taps. 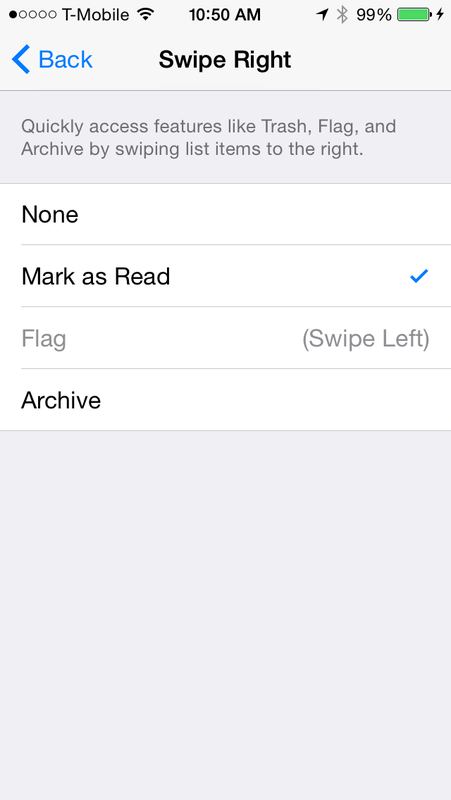 For starters, you can swipe to mark as read or flag, or long-swipe to delete a message. Moreover, Mail in iOS 8 now recognizes a reservation, flight confirmation, or phone number in an email and produces a notification allowing you to, say, add an event to your calendar or a phone number to your contacts. Another enhancements introduces multiple drafts that can be opened at once or switched between in a manner similar to Safari’s new tab view: just pull down on a message you’re working on to look up something in other apps and then tap the message draft at the bottom to pick up right where you left off. There are also notifications for replies to email threads to alert you each time someone has replied to a designated email thread, ensuring you’re always on top of things. To start receiving these alerts, swipe to the left on a desired message, choose More and then tap the Notify Me button, as shown on the screenshot below. 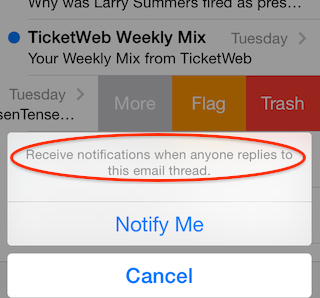 You’ll notice a new bell icon in your message list: it denotes email threads with reply notifications turned on. To disable notifications for a particular email thread, swipe to the left again, tap More and then hit the Stop Notifying button. Finally, Mail also has a dedicated “Swipe Options” section in Settings > Mail, Contacts, Calendars where, as pictured below, you can quickly assign specific functions to invoke when you swipe to the left or right over Mail’s Interactive Notifications on the Lock screen or in the Notification Center. 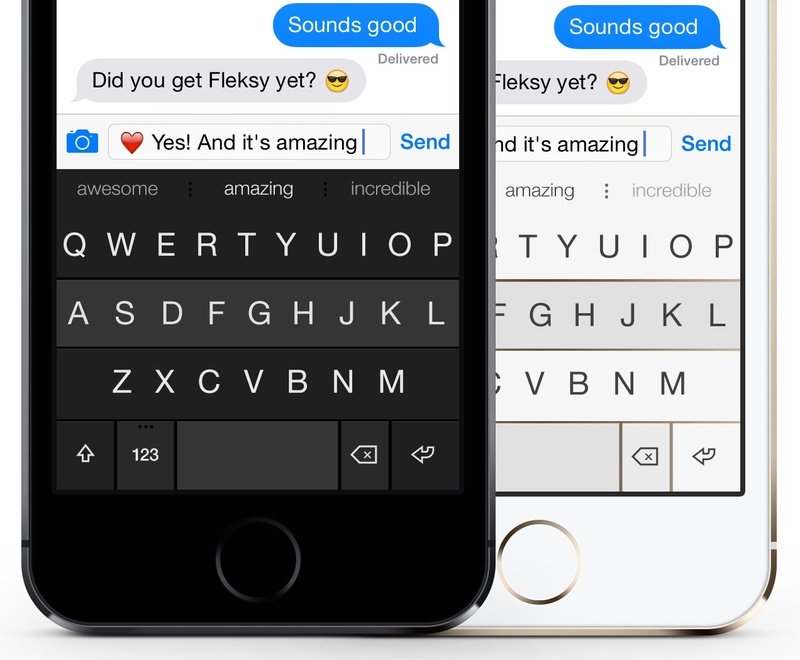 Apple’s keyboard in iOS 8 now, much like Android’s predictive text entry, speeds up your typing by displaying suggested words as you type. It’s smart enough to figure out who you’re chatting with in apps like Messages and adapts its algorithm to your past conversations and writing style. This means that QuickType’s suggestions of words or phrases follow the casual style you might use in Messages, the more formal language you probably use in Mail and more. 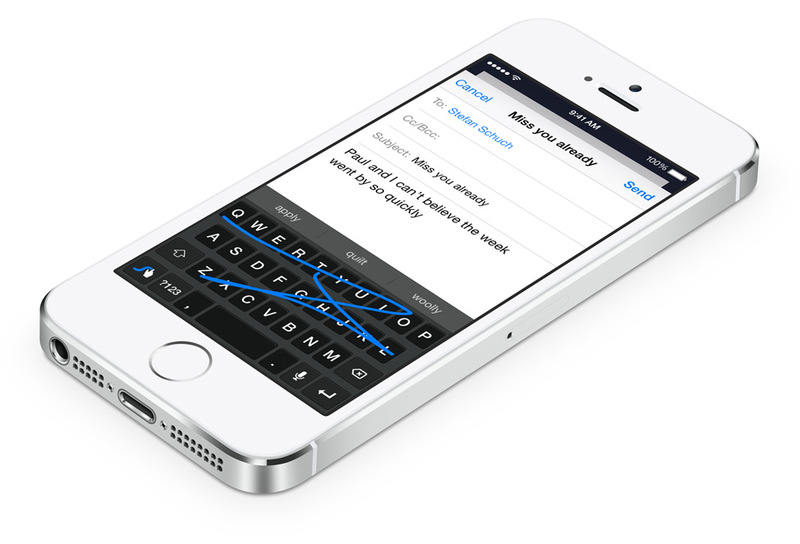 The more you use it, the smarter QuickType becomes because the more your iPhone will learn about the way you text. It’s so smart it analyzes message contents so if someone asks you a question, it offers choices like “Yes,” “No,” “Later tonight” and so forth. Another example: if someone sends a text saying, “Do you want to meet at 6:30 or 7:00?”, the keyboard suggests “6:30″, “7:00″ and “Not sure”. 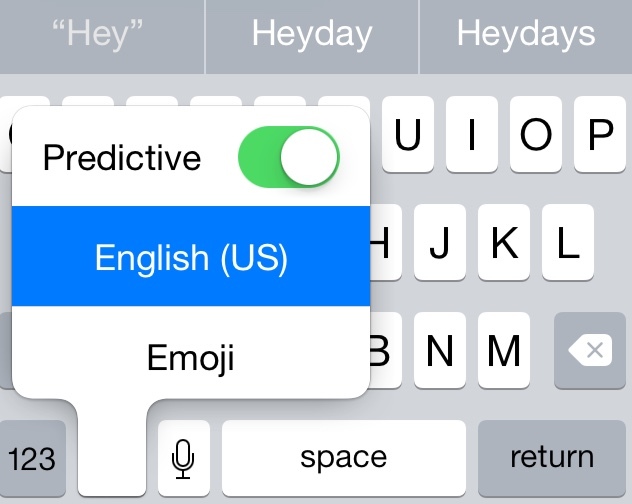 QuickType must be enabled by setting “Predictive” to ON in Settings > General > Keyboard. Alternatively, tap and hold the globe sign on the keyboard to enable predictive input in any app. Supported languages include English optimized for the United States, United Kingdom, Canada and Australia; French; German; Italian; Portuguese optimized for Brazil; Spanish; and Thai. And Simplified Chinese, Traditional Chinese, and Japanese Kanji input continue to feature predictive input. 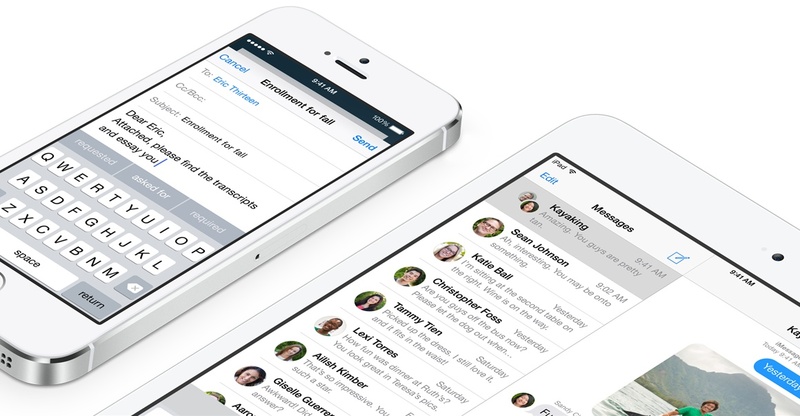 A reason enough for some to jailbreak, Quick Reply has finally made its way into iOS 8. Now when someone sends you a message and you receive a notification, you can pull down on the banner alert and up pops the keyboard. Simply type your reply, hit the Send button and continue right where you left off — no need to switch back and forth between apps just to reply to the message. 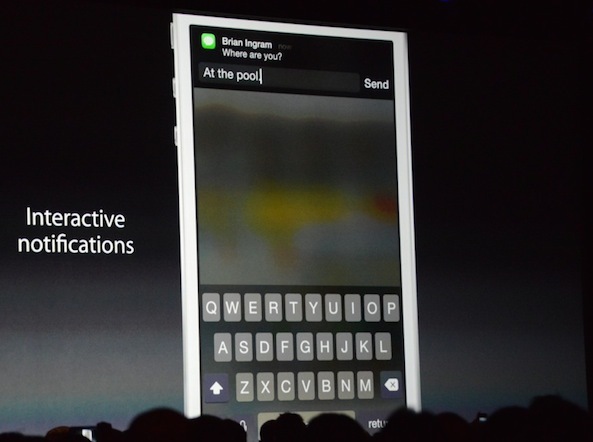 And thanks to the new Interactive Notifications in iOS 8, quick-replying to, say, a Facebook notification may include custom buttons such as Like, or Accept/Reject for calendar events so you can accomplish even more without opening Facebook, Calendar or another app to address the notification. 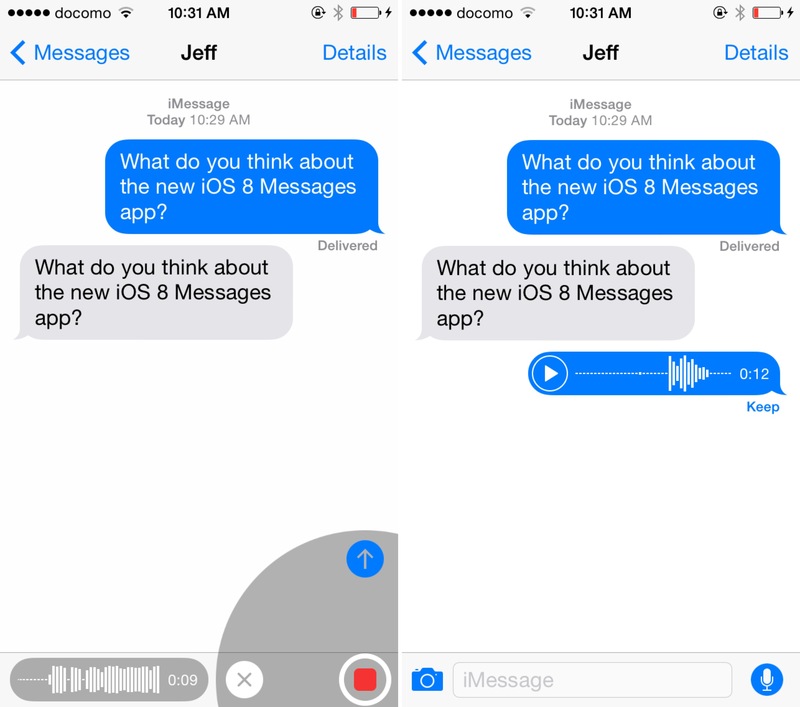 Like WhatsApp, BlackBerry Messenger, Voxer, Snapchat and other IM and ephemeral messaging software, Messages in iOS 8 now lets you add your voice to the conversation that your recipient can listen to and reply to simply by raising the device to their ear (set Raise To Listen to ON in Settings > Messages). To record an audio message, use the new microphone icon in the bottom right of your message view. This brings up a brand new radial menu (useful for a one-handed operation), as depicted above. Keep holding the icon to record your message. 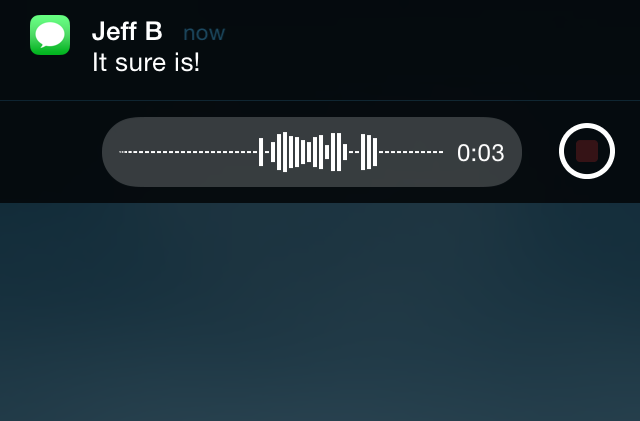 Swipe to the left to cancel recording or upwards to send the audio message. The other side will receive an interactive notification for an incoming message, like this. With Raise To Listen enabled, one can simply hold the handset to one’s ear to listen to the audio. 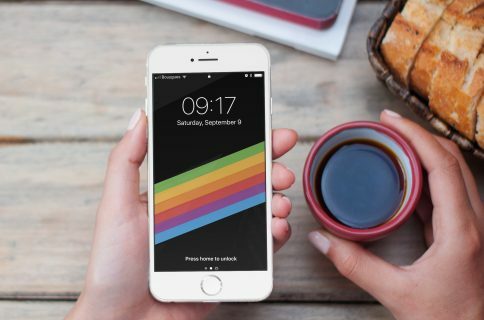 To reply with an audio message, a user would again raise the handset to start talking — all from the Lock screen and without unlocking the device. Options in Settings let you define for how long you’d like to keep audio messages stored on your device, with two expiration options, “Never” and “After 2 Minutes”. 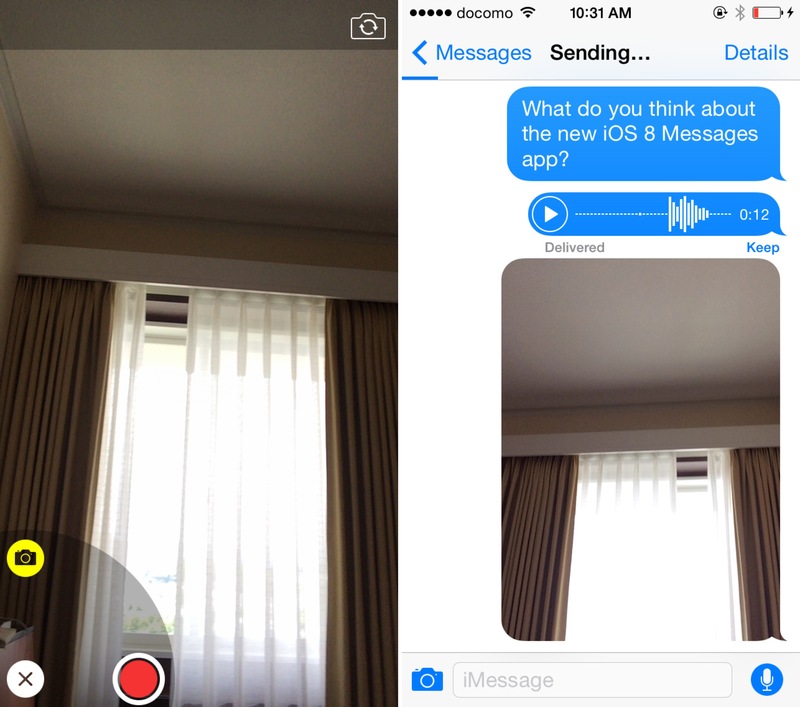 Like audio, Messages uses the same radial interface for quickly attaching a short video to your message. Just tap and hold the camera icon in the lower left of your message view to start recording, swipe to the right when done, or up to cancel, like this. Now you can finally capture those must-see moments straight away, instead of having to go through multiple steps to record and send videos. 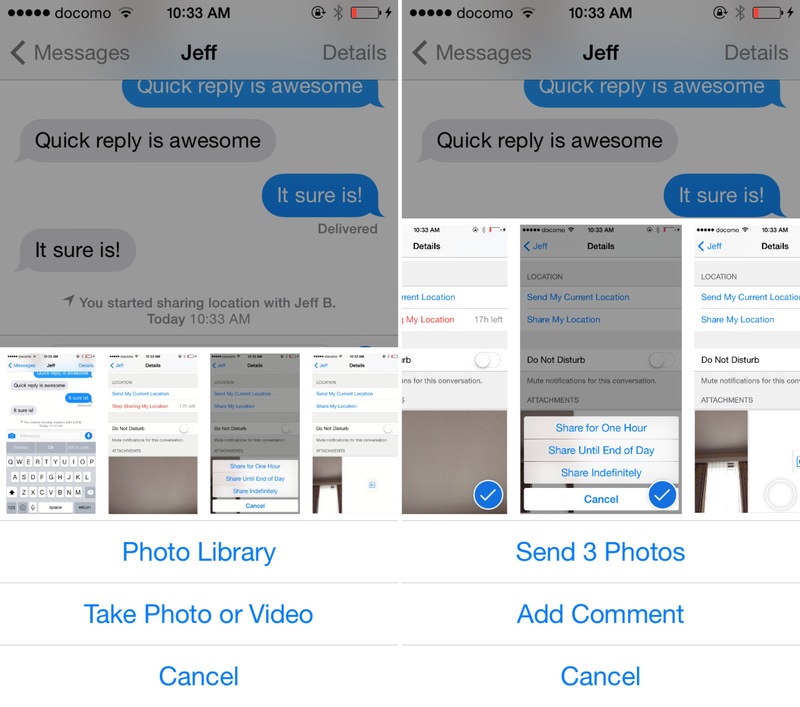 In addition to sending quick audio and video content, Messages in iOS 8 at last allows users to quickly insert recent photos and videos, or even multiple photos or videos simultaneously. Note that media like videos and images are now organized in their own panel in Messages (tap Details in the upper right to access it) so you no longer have to scroll indefinitely to find a picture from earlier in the conversion. Entire Messages history can be automatically deleted as well in Settings. 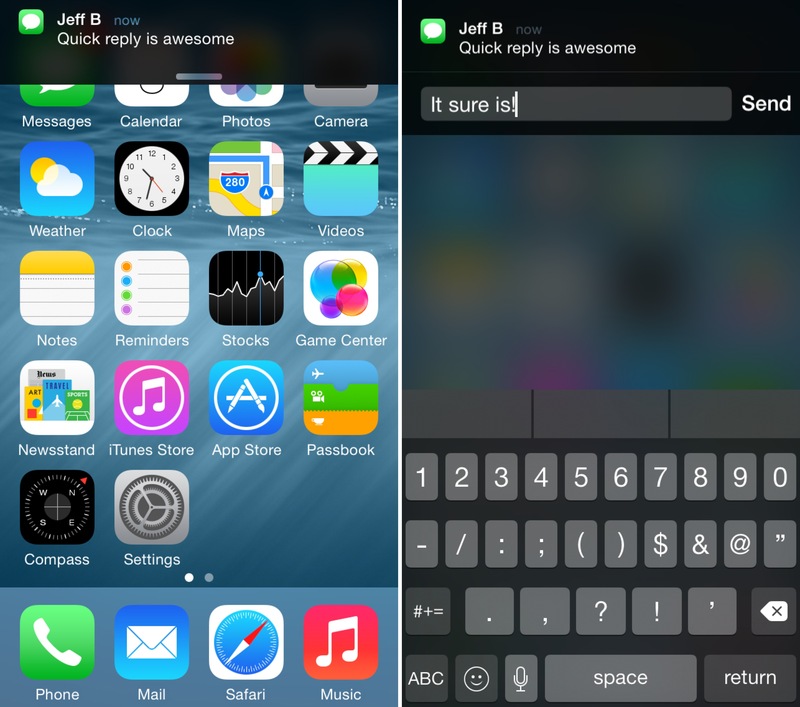 Our own Jeff has put together a nice video showing off the best new features in iOS 8 Messages. Give it a quick watch below for a more comprehensive overview of the app. 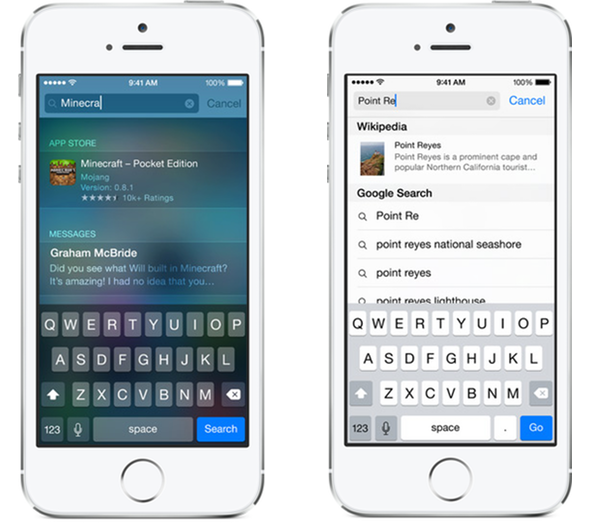 Spotlight in iOS 8 features powerful new search functions. For starters, searching for movies in Spotlight now produces richer information like nearby theaters, showtimes and ratings. 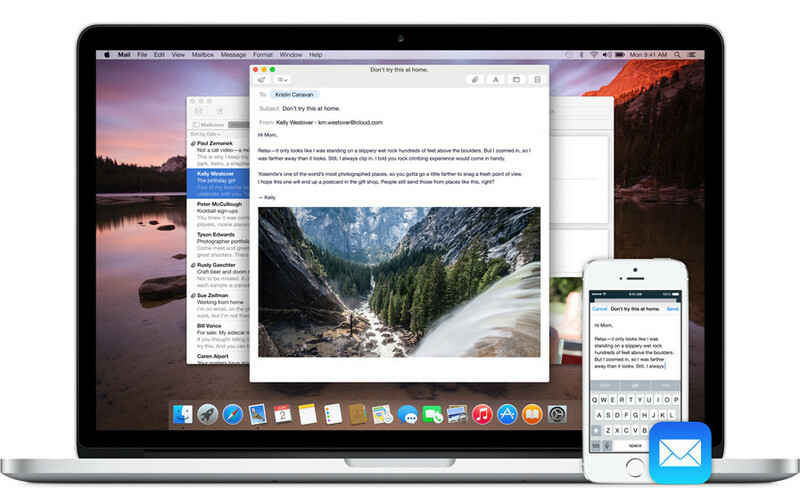 And in addition to searching across stock apps to find exact words or phrases in texts or emails stored locally on the device, Spotlight can now retrieve information from a plethora of online sources. 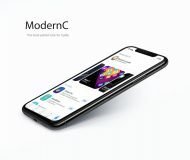 Its expanded scope enriches your search results with snippets of news articles, inline Wikipedia definitions (with a picture and a short summary), iTunes media and App Store app links, suggested websites, nearby restaurants (including the phone number and hours it’s open) and lots more. As a bonus, all of the above can be done from both Spotlight itself and Safari — just tap Safari’s address bar to search with Spotlight integration, with the results appearing alongside your Top Hits and suggestions. By the way, eagle-eyed readers might notice that the ”Search iPhone” field has been renamed to “Spotlight Search” in iOS 8, reflecting the nature of the Spotlight’s broader scope. If you don’t like Apple’s stock keyboard with optional predictive input, iOS 8 now permits you to use third-party keyboards like Swipe, SwiftKey, TouchPal with sliding text entry, Fleksy, Adaptxt, Minuum’s heigh-changing keyboard or TextExpander’s custom keyboard with snippet expansion, to name but a few. These custom keyboards allow for a bunch of different input methods and layouts. Like App Extensions, custom keyboards are not standalone downloads and are deployed as part of the app which must provide some basic functionality. Once the app is installed, the embedded custom keyboard becomes available to use system-wide. Apple thought about privacy, too: custom keyboards are not allowed to log keystrokes. Furthermore, soft-keyboards that do require network connectivity to sync custom dictionaries are required to first request your permission. iOS 8 takes Apple’s Touch ID fingerprint scanning to the next level by opening up the feature to developers. 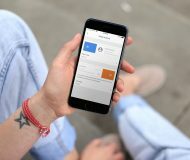 Soon enough, apps like 1Password, PayPal, eBay and more will have the option of using Touch ID to sign in with a simple touch of the Home button, bypassing the need to enter a password. And, storing your fingerprint profile encrypted and protected inside the Secure Enclave on the A7/A8 processor ensures that neither iOS nor other apps can access it. So just as Touch ID on the iPhone 5s simplifies device unlocking and authorizing iTunes purchases, it’ll do the same in your apps and hopefully kill the password once and for all. And with so many great Touch ID tweaks already available for jailbroken devices, imagine what the future holds now that Apple is OK with official Touch ID development. 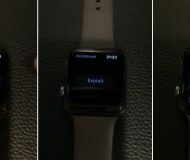 iOS 8’s Camera app brings out a cool feature to shoot video over long periods of time and then speeds it up dramatically. This new time-lapse mode lets you create some incredible effects of the sun setting, the bustling of a busy city street and such. You can access this shooting mode by swiping to it inside the Camera app. Now hit the Record button and your device will start snapping up photos at predetermined intervals. 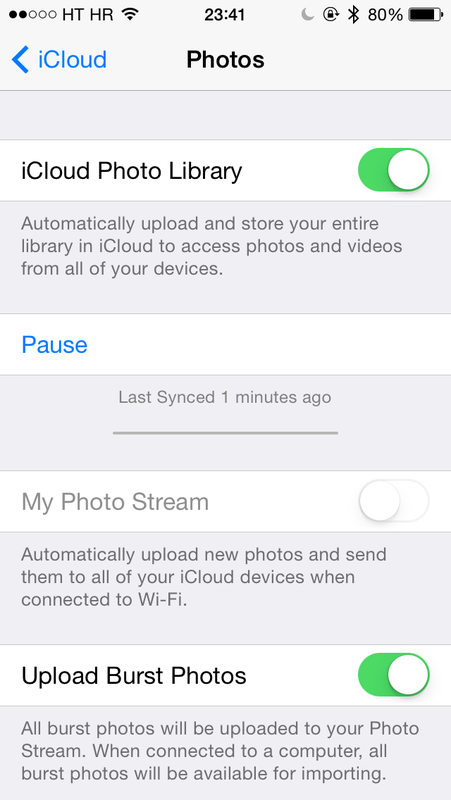 When you stop recording, iOS 8 groups the individual photos together into an accelerated sequence. 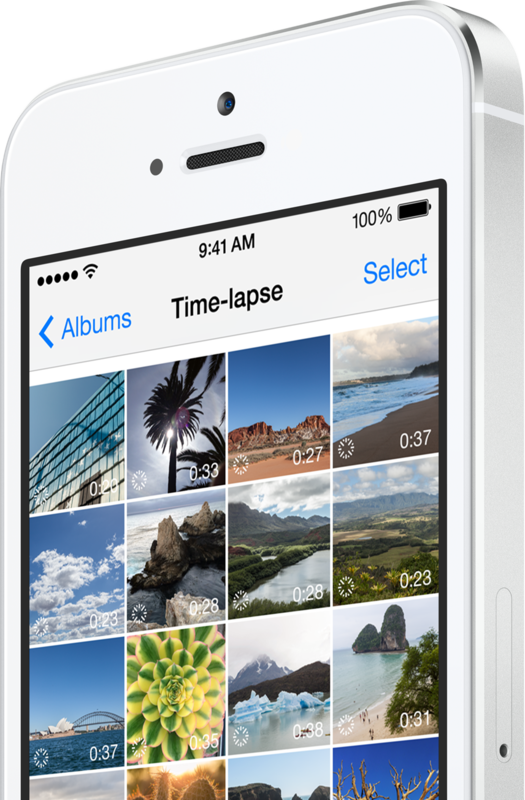 All your time-lapse videos are automatically stored inside a dedicated ”Time-lapse” album on the device. Today widgets are third-party App Extensions that appear in the Notification Center and offer quick information at a glance. 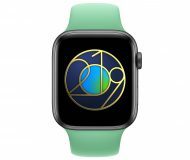 Apple provides several built-in widgets like Calendar, Reminders and Stocks that can be interacted with. For example, the Reminders widget allows you to mark to-dos as completed, right inside the Notification Center. Today widgets are bundled with their apps so downloading one with a widget included automatically makes the widget available to add to the Today view. Just pull down from the screen top to bring up the Notification Center and then tap the Edit button at the bottom. This takes you to the screen with all of the widgets available on your device, allowing you to enable or disable ones you want and change their ordering. Most developers we’ve spoken to are committed to providing widgets (hello, jailbreakers! ), including Philips which is working on an iOS 8 widget for controlling Hue lights. And here are iOS 8 features that our writers, contributors and editors have cherry-picked as their best or most exciting ones. This alphabetically-sorted list is obviously highly subjective as each writer gets to weigh in with the iOS 8 features they think are going to improve their mobile computing most. While I’m a huge fan of the iOS 8’s integration with Yosemite through Continuity features like Handoff and Text Message Forwarding, I think that Extensibility is the most under-appreciated improvement. 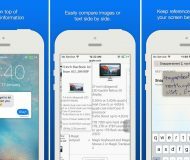 The ability to use third-party keyboards, photo/video extensions right inside the Photos app, custom actions in Share sheets and other types of App Extensions all contribute toward making iOS a much more productive environment than ever before. No longer do we have to wait until our favorite apps gain, for example, the ability to share items on Pinboard or Path or implement Dropbox file picker. 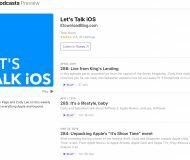 Once Pinboard and Dropbpox release their respective iOS 8 extensions, their functionality becomes available system-wide in most apps. This is going to have profound effects on developers. 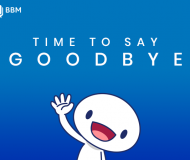 Instead of wasting time implementing Dropbox access or sharing via a third-party service, they can now focus on more pressing things and spend their energies advancing their apps. iOS 8 introduces a number of great new features, but I’d have to say that by far, the addition I’m most looking forward to is app extensions. 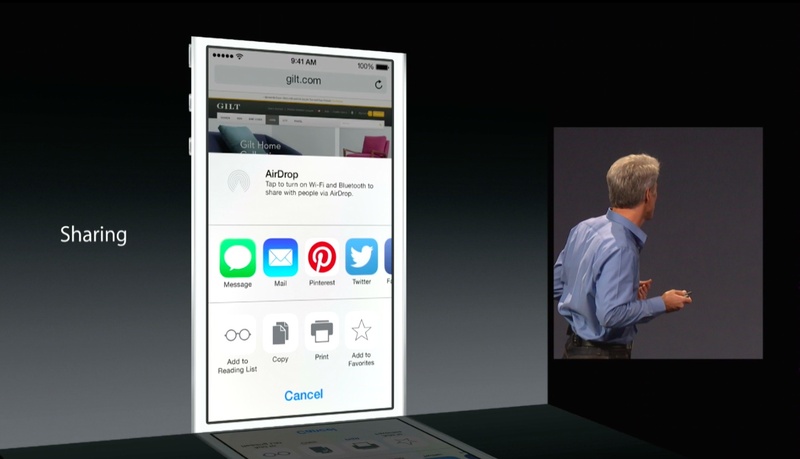 This allows developers to extend their app’s functionality into other iOS apps, and throughout the entire system. My favorite example I’ve seen of this so far is Camera+ 6.0, and its ability to allow users to edit their photos from within the stock Photos app, and I can’t wait to see what other developers come up with. I have long been frustrated Apple hasn’t made iPhone and OS X work more seamlessly, until now. 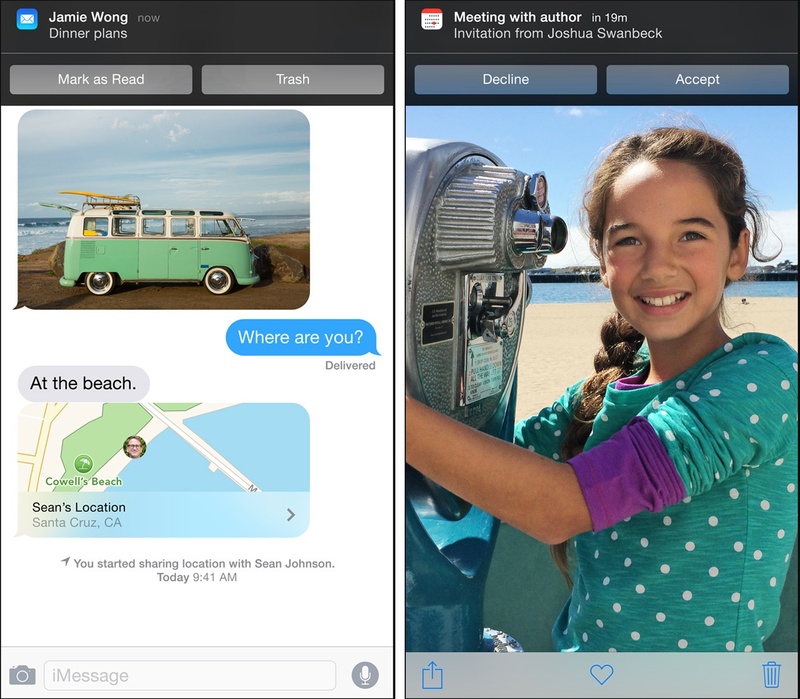 iOS 8 introduces Continuity, and once Yosemite is released to the public, it will allow you to pick up calls and answer texts on your Mac, instead of on your iPhone, and continue editing documents on your Mac that were started on an iPad. Continuity paired with iCloud Drive finally makes me feel like Apple is tightly integrating both its iPhone and OS X platforms, making it a deadly combination against competition. One of my favorite features is the new Instant Hotspot, because it makes using Personal Hotspot totally seamless, with zero configuration. It makes it almost pointless to buy a cellular enabled iPad if you have an iPhone. Hey Siri is my next favorite feature. It makes it so that I can manage my alarm clocks, check on stocks, and weather with my eyes closed. It’s perfect for getting an idea about your day while still in the comforts of the bed. 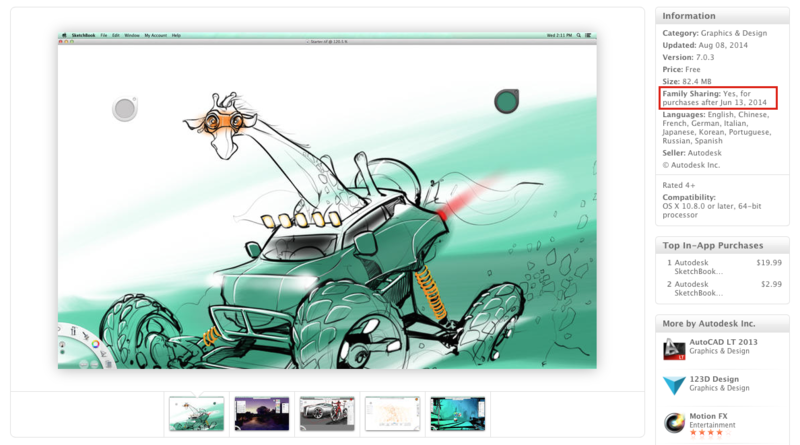 Request Desktop Site in Safari is another favorite feature. Now we don’t have to download Chrome just to be able to browse to a site’s desktop version. Not to downplay all of the other great iOS 8 features, like Continuity, HomeKit, and third party integrations, but I am most excited about the simple inclusion of Quick Reply for alerts. When it comes to hourly use of my device, the thing I use my iPhone for most frequently is communicating through iMessage. The ability to instantly reply through a banner will save me countless hours over time. Handoff is the feature I am most looking forward to. 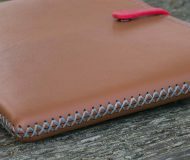 I am always reading emails on my iPhone and want to respond to them in a more convenient way on my laptop. With Handoff, I’ll be able to pick up right where I left off from one device to the next. It also works with Safari and Messages, which I interact with on all my devices, as well as Pages, Numbers, Keynote, Maps, Reminders, Calendar, and Contacts. With third-party Handoff, I’ll be able to seamlessly work between devices in all manners of apps. Without a doubt, the feature I’ve enjoyed the most while running the iOS 8 betas has been the addition of extensions. Be it the way 1Password can now hook into apps and websites or the quick calendar access in Notification Center offered by PCalc, extensions are going to change the way we use iOS forever. The fact that Apple is opening up more to developers is probably my favorite thing about iOS 8. Features like third-party keyboard support, widgets, extensibility, and the new Touch ID APIs make for an amazing update. Of course, Android users will yell “first,” and rightfully so, but as we’ve been able to verify before, being first doesn’t matter if you can’t do it right. I’m not sure yet whether I’ll be using any of the third-party keyboards that will make their way to the App Store, but the option of being able to use them is awesome in itself. I think widgets will change the way we use our devices for the better. I’m not talking about standard widgets (ie. ESPN widget to show your team’s scores in Notification Center). I’m talking about how developers will take advantage of this new feature in ways we haven’t even thought of yet. Extensibility will be a great addition too and make for a more seamless experience. I can already see myself using the Instagram share extension to send a photo to Instagram directly from the Photos app. 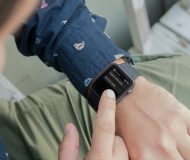 This feature definitely has a chance to change not only how we use our devices, but also how we use the apps on our devices. 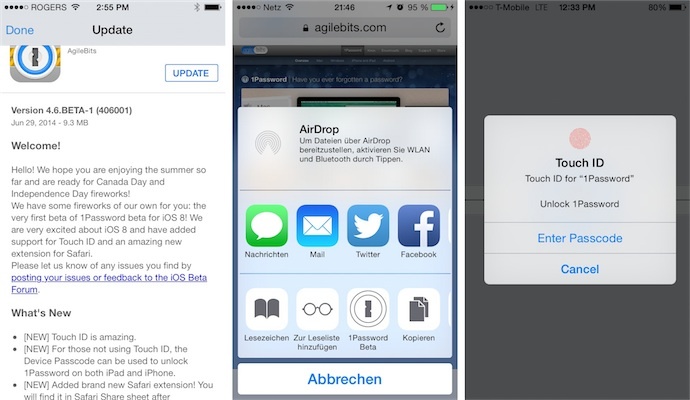 Finally, Touch ID support for third-party apps will bring yet another level of security to everything we can do on an iOS device, and just like widgets, I think developers will be able to do wonderful things out of the Touch ID APIs. 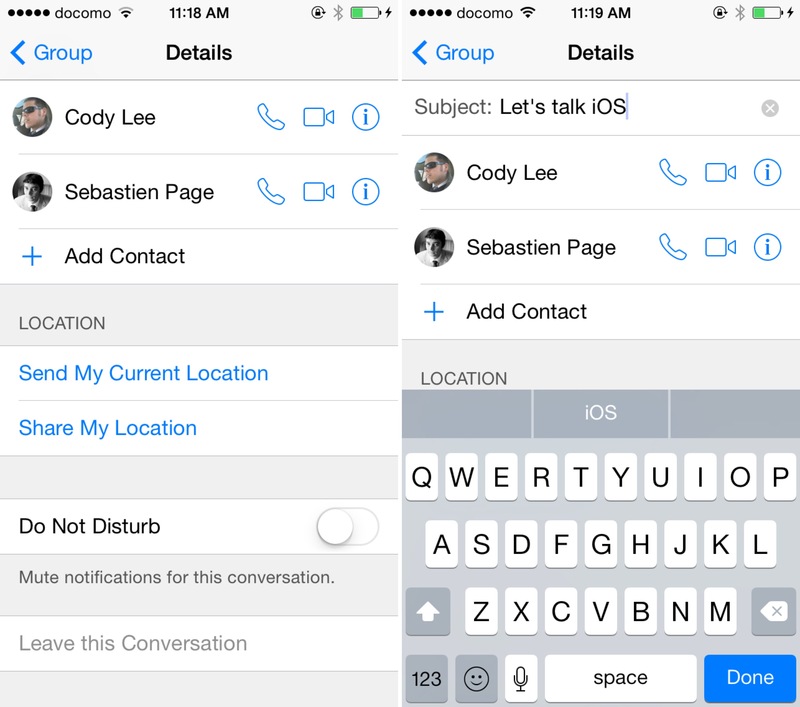 For me, the best features of iOS 8 are those that are developer-driven. The third-party apps on a device are a massive part of what lead to an enjoyable experience, and with developers being able to update their apps to support Extensibility, Interactive Notifications, the “Kits,” and Touch ID’s API, this could very well be the best iOS update we’ve seen thus far. While I’ll certainly enjoy new stuff in stock apps like Messages and Mail, the real excitement lies in exploring what developers have done with their newfound freedoms in iOS 8. 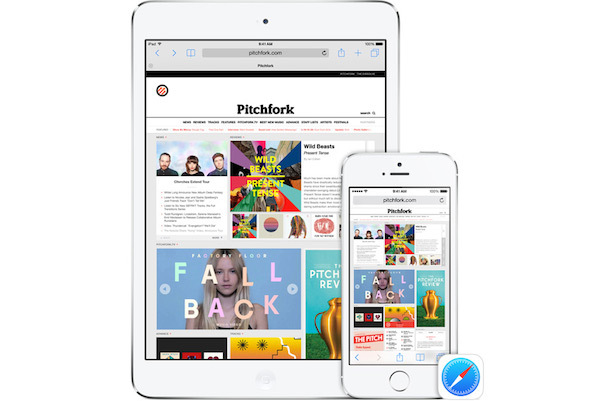 We hope you’ll enjoy reading this comprehensive outlook of best iOS 8 features as much as we have putting it together. 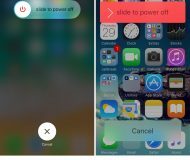 By no means does this tutorial cover everything that Apple has introduced in iOS 8, but for the time being these are the features we think most people will focus on. If you think we’ve left out an important feature, or would just want to chime in and suggest topics for upcoming tutorials, please do join us in comments below.